The fourth major bodywork program adopted by the Lomi School, Polarity Therapy, concentrated on the energetic grid of the body and relieving blocks in it. Dr. Randolph Stone (1890-1981), the founder of Polarity Therapy, emigrated to America as a youngster around 1898. 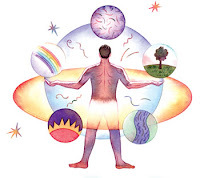 He completed his primary medical certifications in the early 1920s, including Doctor of Osteopathy, Doctor of Chiropractic and Doctor of Naturopathy, but he was a lifelong student, eventually adding certifications in a wide range of topics including massage and midwifery. His love of travel took him in search of medical insights from other cultures. The good doctor maintained a medical practice in Chicago for over 50 years, where his motto of “Whatever works, works!” established his reputation for taking otherwise hopeless cases, many of whom responded to his unconventional techniques and multicultural approaches. Endlessly curious, Stone was fascinated by spiritual studies and mysticism. In the 1940s he deepened his knowledge of and commitment to esoteric understanding by accepting initiation in a meditation system based in India. His dedication to this yogic path continued uninterrupted for almost 40 years, and he made frequent visits to India to study and develop his inner knowledge.